“As Bloom once told a reporter: “We were looking for exceptional kids and what we found were exceptional conditions”. […] The “exceptional conditions” we found can be summarized under the headings of opportunity to learn, authentic tasks, and exceptionally supportive social contexts.” ~ Lauren Sosniak, p289. I found this quote here in Doing What Works in Solutions Focussed Change and it got me thinking about my work, parenting and change. As parents we pay attention to our children and hope that they will end up happy, with a healthy mix of self confidence, resilience and empathy toward others. We are also blind to much of what others, outside of the family unit, can plainly see. Lately I’ve been playing around with some ideas and they are all about cultivating the right conditions at home … conditions that allow my children to learn, make mistakes, say yes more often(!) and reflect. The quote above has me determined to experiment a little more and be much more playful along the way. – Play more ‘noticing’ games that orient the focus of family attention to the present moment. The stuff that is unfolding right in front of our eyes now … the bird tapping at the window … The wind in the trees … The silence of the moment. This requires that we, as parents, be present first. That our kids hear and see us being absorbed in the moment. I can’t remember where I heard this little lesson, but it comes from Theatre … “Act like people are always watching, even if no one is there.” This lesson was in reference to a live performance where actors played out scenes in many rooms of a house. The audience moved from room to room, at their own pace, in their own time. Many rooms contained only actors and no audience, but the performers kept on going … as if the audience was present. Imagine if we all, as parents, as leaders, as friends, as co-workers, acted with integrity and honesty … even when no-one is watching. If you have my previous posts, you will be aware that I spent time working with the folks from Australia’s contemporary Circus and Physical Theatre sector. The event was called the Flashpoint Forum and was hosted by the sector’s peak body ACAPTA. 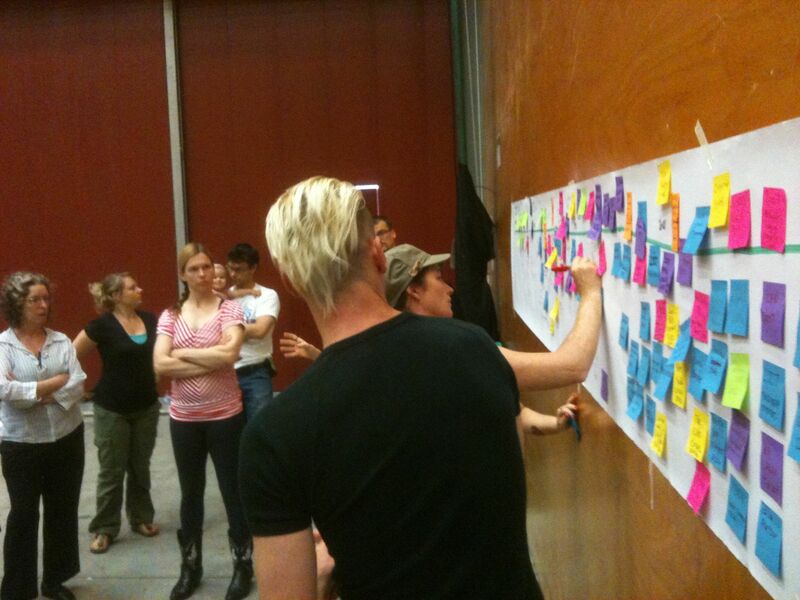 When the 2 days of Open Space was over on the Friday, everyone (26 plus a few others) came back together on Saturday. I’ll admit to feeling nervous about this day. I was asking myself questions like … “why don’t we simply continue Open Space for another day?”. Here’s a story the group created, performed and recorded in just a few hours. On the Saturday morning, the group decided they wanted to create something … a story that brought together the essence of their conversations … and product that could be shared with others in their sector. Flashpoint started and people arrived last Wednesday afternoon. Dinner that night featured an inspired talk by Kelly O’Shannassy (CEO of Environment Victoria). Kelly’s key message was that we need to re-imagine the future, side step the barriers and move to solutions that create new systems, new ways of creating stuff and of working together. Kelly provided another dimension to our forum theme, “The World Needs Saving and Circus & Physical Theatre is the Answer”. 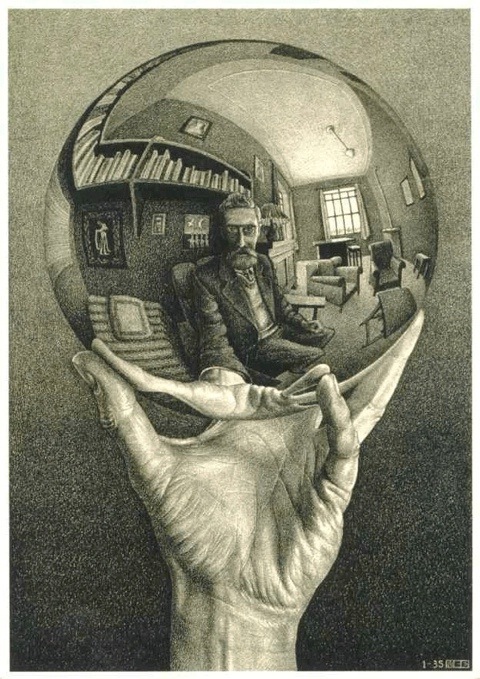 The new dimension was about ‘re-imagining our future’ … re imagining the future of this sector to make it stronger. After Kelly, we were all treated to the vocal and comical brilliance of Intimate Apparel. History Trip – Once I got the group started with the ‘ways and wares’, I sat back and participants took the lead on mapping and sharing stories of Australian contemporary Circus and Physical Theatre. Everyone was completely engaged and energised by this activity and the outcome is going to become a book! Another little harvest was a set of ‘key features’ from their history that we need to remember and carry forward into the future. 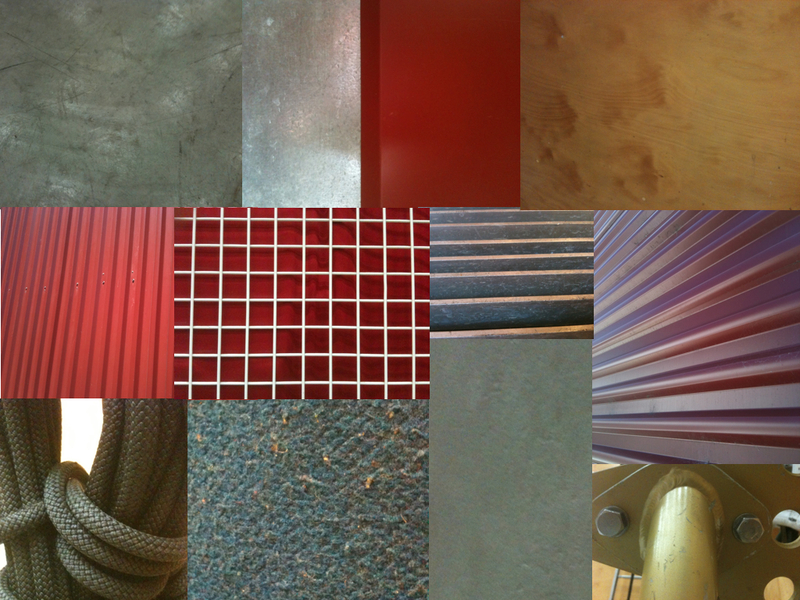 I used a set of photos called Visual Explorer (CCL link here) to elicit these ideas. 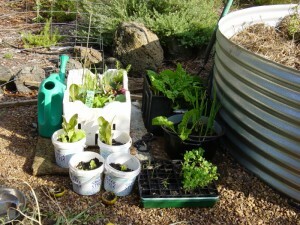 Lifecycle of Emergence – You can read all about this activity in a previous blog post here. 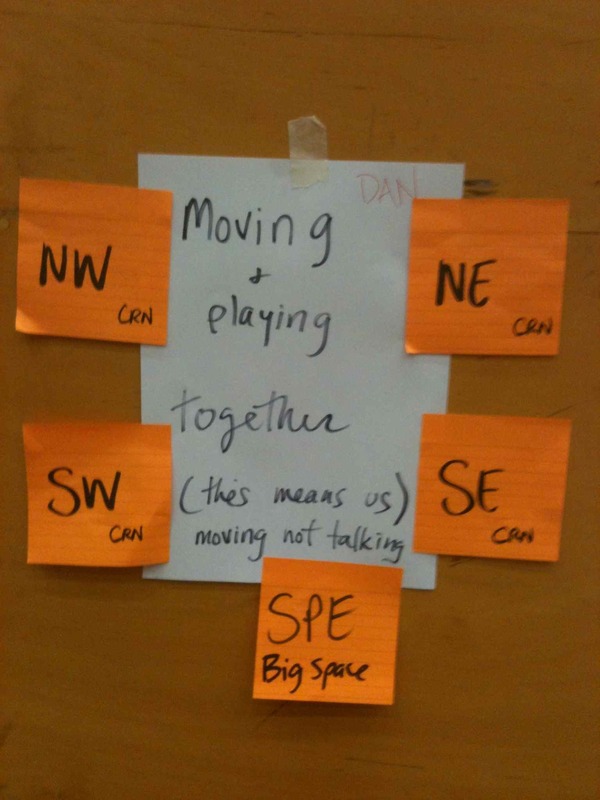 Open Space Kick Off – You can read more about my approach to opening space here – a blog post about my teachers. I admit to being nervous, however, the morning discussions and activities appeared to really engage the group and our theme became really clear. A summary of each concurrent session was published directly to the ACAPTA Blog here by session convenors. A summary of each action was also published directly to the ACAPTA Blog here. 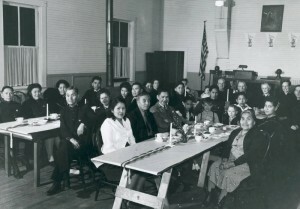 Then, after 60 second report backs from each action group, an offer came the group. 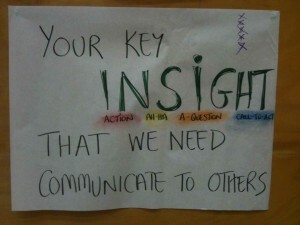 A few wanted to capture their key insights from the forum – insights beyond the action topics. So, before the closing circle, we played ’35’ to capture the key insights. You can read about 35 at Viv’s blog here. Even more performances … this sector knows how to throw a party and improvise! Given the influx of new participants, we started by ‘re-living’ the whole forum from beginning to end. It was clear the group wanted more conversation and this reinforced my self talk about continuing Open Space for another day. Instead, the group framed their own question and we entered a World Cafe process. The idea of creating something together emerged and the group set about creating their structure and story which became the video above. To support the group, I offered the Story Spine and Pecha Kucha structures – neither were used but they did focus the group on the ‘process’ of their task. PM – see video creation above and this post at the ACAPTA Blog. The Flashpoint Forum taught me more about the concept of ‘holding space‘ than any event before. For the first time I was able to get out of the group’s way and provide a space and process to support ‘their work’. I noticed more about this group than any other I have worked with and responded in small ways to support them. For the first time as a facilitator, I managed to STOP myself from trying to control stuff … and let the group work it out. This was true for the Open Space and for the more structured sessions. Lot’s of lessons here! Most times when we talk about ‘spaces’ to run conferences and gatherings in, we talk about the size, number of breakout rooms, location to accommodation and public transport, access to wifi and other logistical features. Rarely do we talk about texture. The texture of a space gives it a certain feel and atmosphere. It’s purely subjective I know, but it can make a big difference to the ‘experience’ that individual and group has. I am facilitating the ACAPTA Flashpoint Forum at a great venue called ‘Legs on the Wall‘ in the suburb of Lilyfield in Sydney, Australia. It is a purpose built training facility for those in Circus and Physical Theatre. It is large and cavernous with incredibly high ceilings … somehow, the acoustics and texture makes it intimate enough for even a small group of 30. You can talk quietly and everyone can you … everyone can be talking at once and the noise is dampened. I fly to Sydney tomorrow to work with ACAPTA on their big, bold Flashpoint Forum. 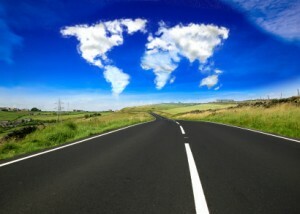 ACAPTA’s dynamic CEO is leading change and a new way of meeting together. ACAPTA is the peak body group for a group of people who make up the Circus & Physical Theatre field. 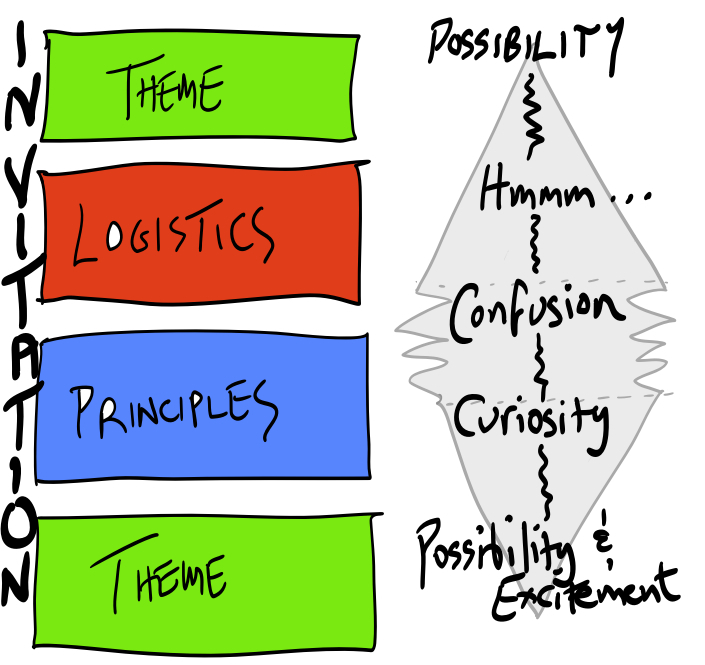 This diagram sets out the basic order of opening space … from the orientation to the Theme – to logistics – to Open Space principles – & back to the theme. Running alongside these is the experiential journey of participants … from Possibility – to ‘Hmmm’ – to Confusion – Curiosity – & then Possibility with a twist of Excitement. I like this as it appears to use Sam Kaner’s Groan Zone Model (The Diamond of Participatory Decision Making). Importantly is the language that Chris uses … “Remember, it’s an INVITATION”. We don’t ‘tell people’ what to do, instead ‘we invite you to …’. When opening space we ask questions like ‘So, how are we going to do this?’. And importantly at the end ‘you gotta finish it, with a crisp ending’. Chris used the term “Terminal Shutting Up”. Viv is reading Dialogue: The Art of Thinking Together by William Isaacs. This is recognising the power you have as a facilitator and letting it go, and to be comfortable notbeing the centre of attention. In fact, it’s about actively ensuring that you are not the centre of attention, and recognising the ideas that emerge from elsewhere. Johnnie explains it like this: “You can have a bad time in open space by waiting for someone else to post a topic that you are itching to discuss; you can go to sessions and be bored, staying there getting more and more frustrated; and you can come to me at the end and tell me that open space doesn’t work, or that other people need to be better prepared, or that you wanted something that you didn’t get.” Or any variation on that theme. 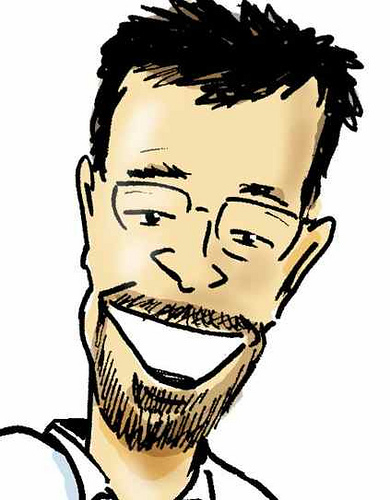 Chris offers some great insights here on ‘What it take to change an operating system‘. The one I’ll remember is this one because I have made loads of assumptions about the group I’ll be working with! The “How” question is one I’ll be asking in Sydney. And I’ll be running an activity that Chris and I used in Melbourne earlier this year to bring this insight to life. 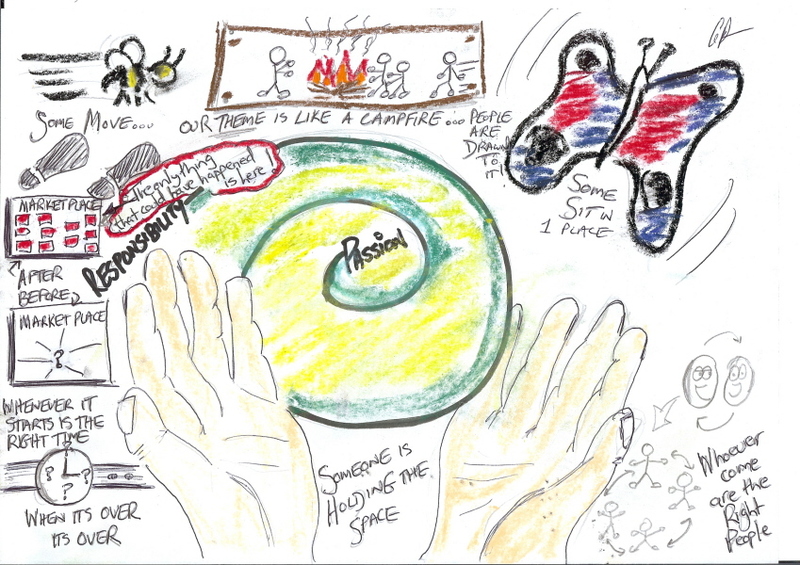 It draws on a Called Lifecycle of Emergence, it is explained and drawn here by Dave Pollard. “There’s some paradoxical contract at the heart of facilitation where we talk about empowering the group but nevertheless are getting paid to bear responsibility for what happens. Sometimes that’s a engaging paradox, and sometimes it just hurts to sit there feeling real or imagined pressure to “do something” when doing nothing feels like the right thing to do. Over at Faris’ blog here, he writes about a company that brought loads of people together and gave them something to do as a part of their branding . Watch for yourself. “The key is to produce something that both pulls people together and gives them something to do. I think this is probably the key to unlocking the awesome, and the biggest win for any kind of brand related action. Let’s apply this principle to all Sustainability Projects, Conferences and Gatherings in the future. For me, the key here is that the ‘crowd’ are given the power. The crowd can contribute to the outcomes and they are not treated as ‘consumers’ or ‘spectators’ (even though the whole thing is staged an is about selling stuff). An event like this also creates Word of Mouth (WoM) about your ‘thang’. People talk to other people about stuff that inspires them. Open Space Technology is an approach to running workshops and conferences. When people come together in Open Space, the people/crowd/delegates create their own agenda and are responsible for their own outcomes. The participants are supported to self organise and contribute fully. An attractive and provocative theme provides the direction and reason for being there and our social instincts take over from there. It just works! 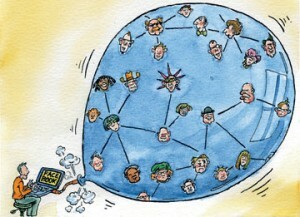 And why are many government agencies & corporates still resisting Web 2.0? Euan’s post “Most companies who try to do Enterprise 2.0 will fail” provides 8 reasons why. This little piece of artwork caught my eye today from the beer garden at Hotel Brunswick (in Brunswick Heads, northern New South Wales). 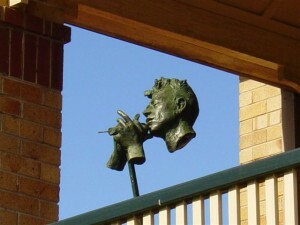 At a glance, the bust of the singer appears to be suspended against a blue sky backdrop. Below him is an outdoor stage where weekly gigs are held. Hotel Brunswick has recently been refurbished. The final result is a space that makes me want to return again tomorrow. I have already “remarked” to many about our experience … I suppose this makes the space “remarkable”. During our second visit I noticed how “uncluttered” the space was. There was not a single chair, table or sign that was not needed. 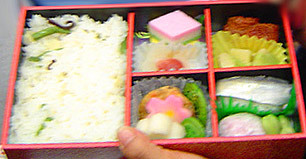 Like in this post by Garr Reynolds (Presentation Zen), he explores design by reflecting on a “Bento” purchased from a Japanese train station. Well, Hotel Brunswick is the ‘bento’ of pubs! Beautiful, balanced, nothing lacking and a truly wonderful space to experience food, music and conversation. Today is Sunday and I was involved in a community engagement event with a government department and a community adjoining a newly announced National Park. The draft plan was the focus and topic and conversation. I was involved in 3 of these Community Engagement events which were wonderfully orchestrated by Carla Rogers using her version of the Open House (aka iForum) event. I was in the wonderful position of being a co-facilitator … a hired-gun … a second pair of eyes and a second voice. Learning #2 – Work more often with others facilitators & encourage clients to go the extra step and employ 2 facilitators for BIG events. I learned heaps about a new way of engaging with communities. I learned much by watching Carla. We (Carla, me and 12 staff) arrived at the venue to set up for the Open House. An organised protest-group were there to greet us with a tent, placards and protest forms. They (somehow) managed to “hire” 2 rooms within our venue and secured the main 2 entry points to the inner sanctum of the Open House. What to do? Improvise! Carla and I rallied together the troops and called for calm … in fact we put on our hats of compassion and continued to smile through it all. We found a rarely used rear entry point and threw our resources at getting that functional. We continued to Improvise … all our plans, in the heat of battle, had the be altered. The protest-group (aka Space Invaders) slowly self imploded as the day wore on. Our invisible entry point became the community’s sole focus and their protest became silent. Within, their ranks became embarrassed as they realised that our engagement process was working. By 2pm today, their leader had lost his power and the term “losing face” was overheard. Learning #3 – Improvise. Ensure you do enough planning (eg. resources in place … know your message) BUT always be prepared to throw out your plan on the day. Learning #4 – Accept all offers (even the Space Invaders) – Once it was clear we could do nothing to remove the Space Invaders, we quickly re framed and said in a very Ben Zanderish kind of way … “How Fascinating! !” Once we let go of our control of the venue … we just got on with it and did the best we could. And we did good! The Holding SPACE part of the story … Like the Aireys Inlet Music Festival, Carla’s Open Houses pay close attention to space. The Open House allows conversations and engagement at a wide range of levels. It feels like a community market place with a Cafe area, Graffiti Wall, Information Tables with maps/info and staff to answer questions about the topic. At the front end everyone gets an overview/tour and then participants “self organise”. In some place it feels like an Open Space workshop where people take responsibility and use their feet to go where they feel most engaged. It wraps up with a 1 to 2 hour facilitated workshop for those want a more in depth discussion and a chance to engage with other’s in their community. 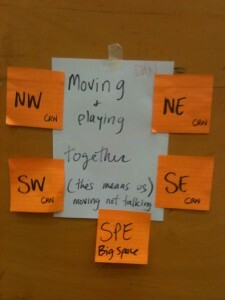 Learning #5 Self Organising Spaces work! – The Open House Space is interesting and it allows people to explore a topic and behave like they do at a community market, or in a coffee break. It allows people to self organise and take responsibility for getting the most out of their time. Learning #6 Be prepared AND respond in the moment – Carla and I drew up simple workshop plans for each Open House event. We really liked each plan too. When the workshop time arrived … we changed it! We responded to the weather, to the space and to the size and general mood of the group. Our planning gave us the freedom to move and improvise in the moment. 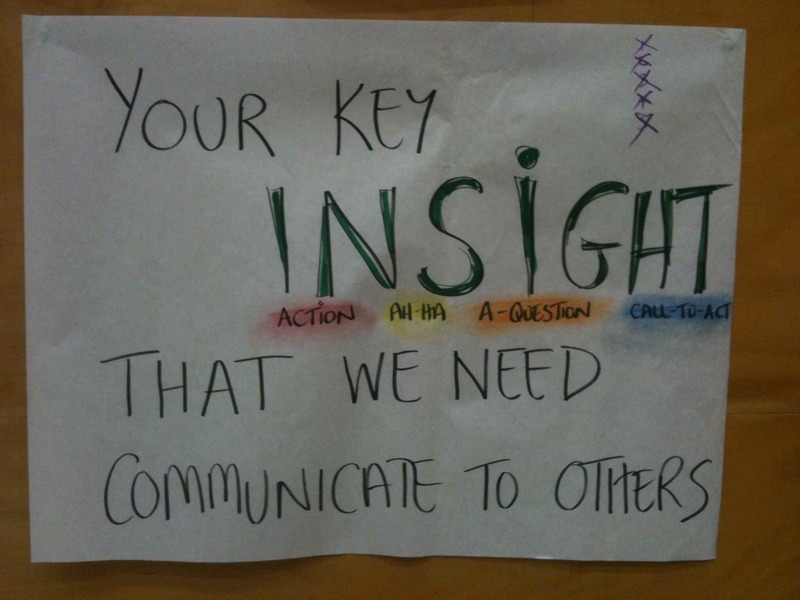 I’d love to hear about moments in facilitation where improvising worked for you! 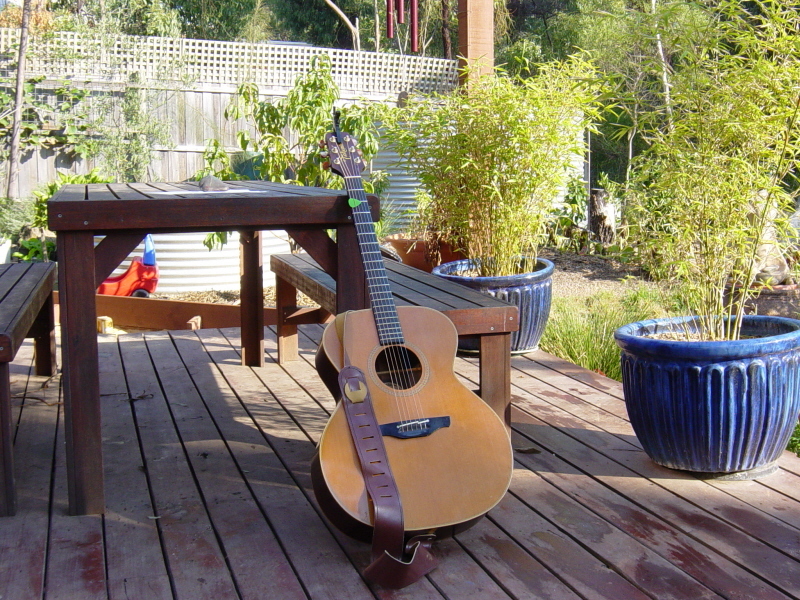 Once upon a time … I was asked to help stage a local music festival called the Aireys Inlet Open Mic Music Festival. Marty Maher (a local businessman who really knows how to contribute to community) asked me to get involved … I love music festivals and I could not refuse! Marty said the essence of this festival is simple … It’s all about the music. Marty did most of the grunt work behind the scenes and I had the pleasure of performing with long time friend (David Jurianz). I donated my PA system and my time as MC for the outdoor gigs at a local cafe. Then one day (Friday 11th April 2008) … the musicians arrived, guitars were tuned and music lovers gathered to listen in their favorite spaces. What followed … The music was local, raw and had an appealing rough-edge that was both refreshing and inspiring! Musicians had to be ready to just turn up … plug in and start playing. No fancy sounds checks and, for the bands, guitarists had to settle for the guitar amps that we supplied. Most acts had 30 minutes to strut their stuff and where gaps existed in the program … walk-up performers were welcome to perform. Here’s a short video of just a few of the acoustic acts that performed on the Saturday and Sunday afternoon. Until finally … the music stopped playing, bags were packed and spectators & performers were nourished by their shared experience of the music, intimate spaces and conversations. *The power of the Theme – It’s all about music was the theme. That meant no poetry, storytelling or art. No frilly markets or selling of products on the side. The whole festival was about 1 core thing … music. This simple principle was applied to all invitations (to musicians & music lovers). The theme resonated loudly and people came. 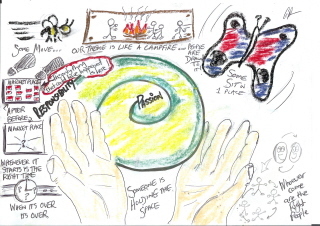 *Passion bounded by Responsibility – Without responsibility … passion is all hot-air. Without passion … well who really cares? From the theme [Its all about music], the passion-meter was running high. Within a few weeks, our ‘word-of-mouth’ invitation campaign filled 50+ music spaces on our empty festival program. When their time arrived to perform, all the musicians were tuned up and ready-to-go. They took responsibility for being present & making it work! 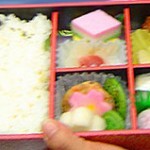 Within the small festival organising group, individuals took responsibility for the things they were good at. Their passion + Their Gift = Sense of Purpose. As a result stuff got done and done well! We had one face-face meeting and a few informal emails. That was it! It worked. It rocked! *Starting with a blank agenda – A month before the festival we had ideas, a theme and a couple venues. When we opened the space and invited musicians, our blank agenda filled quickly with a diverse range of acts. Bands, duos, trios and soloists. Blank spaces were offered for anyone to spontaneously get up and perform. One guy travelling through from Western Australia seized the moment and did his first ever live performance. His guitar playing was basic and he struggled to sing in tune, but the audience just loved him and he was moved to tears. 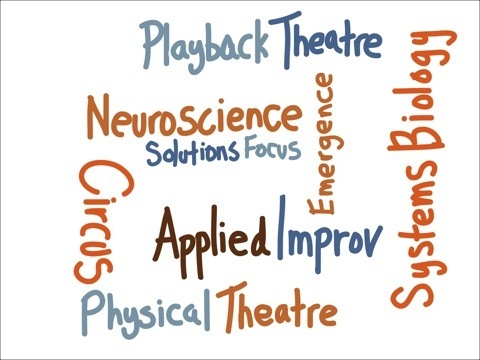 *The importance of Letting Go – In Improv Theatre, letting go of control and outcomes is a core principle. In Open Space its the same. At the festival, we had to trust ourselves, the musicians and the audience, and let go of preconceived ideas of where it would end up. We also had trust in our theme … Its all about music. There is also something in here about “Whoever comes are the right people.” We were not worried about the people who didn’t come, or about the numbers. We engaged with those who came and they were the only ones. *Beware the Space Invaders – “Often in the run-up to an Open Space (or a music festival), these folks try to suggest little “improvements” to the process (eg “to make sure success happens”) which nearly always are ways to remove time from participants and replace openness with predicatability. They claim they are introducing more structure, but really they are preventing the emergence of organic structure. This is usually on the unconscious assumption that they know better than everyone else what should happen. 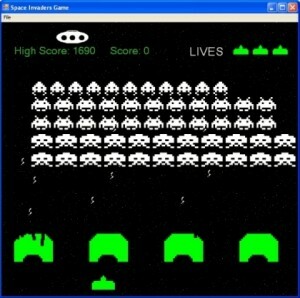 Nancy’s term for these folks is ‘space invaders’.” Johnny Moore’s Blog. I encountered 2 Space Invaders. Both of them were musicians who had run events like this one before. Both struggled with the small audience at the 12 noon kick-off on both Saturday and Sunday. They suggested ways of getting people to come (eg. putting up more signs) … like there was some sort of “lever” that could be pulled and magically people would arrive. I said, “let’s just wait and see what happens when the music starts.” (In other words, I just honored the Theme and allowed stuff to emerge in the space). On both days, the sound of acoustic music rang out in Aireys Inlet at 12 Noon. On both days, a very healthy audience assembled by 12.30pm. On both days people stayed until the final song at 5pm. *The 2 daytime Spaces were engaging and supportive – The Cafe attracted the latte-set and the Beer Garden the pub go-ers. On their own, these spaces attract people into conversations anyway. Add some great local music and they take on a life of their own. As the facilitators, we paid attention to the quality and volume of the music. Musicians had 1 less thing to worry about and were able to focus on their music and story. The audience were treated to a great sound without being too loud. After all, people want more than just musicians and music. The real reason people attend festivals is to spend time with people they love, meet new people and share conversations and stories. *Butterflies, Bumblebees & The Law of Two Feet – By design, many of our musicians were bumblebees as they buzzed from the Pub to the Cafe and back again. The music lovers were free to come and go as they pleased. A few travelled between the pub and the cafe … most found a group of people and just sat (like butterflies in Open Space), chatted, drank coffee or beer and soaked up the music . *The musicians were engaging and the audience were involved – I can only speak for the Cafe venue here … if this music festival was a conference, then our keynote presenters were facilitators. They told stories, they listened and read their audience. It was a 2-way process and everyone was learning. The audience and musicians chatted and hung-out in between acts. No one was ‘the expert’ at this conference. We were all in it together. What SPACE are you in right now? What interests me is the SPACE that you’re in right now … the SPACE you stumble upon tomorrow … future SPACES that we co-create to build relationships between people and to bring about change. 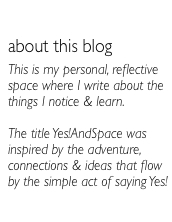 I’ll be exploring all sorts of spaces (both physical and metaphorical) on this Yes!And Journey. When I look back at the key turning points in my life … when transformative change happened … the SPACE I was in always played a lead role. As a dinner date with Vic McWaters and Dave Pollard draws closer, let me share some of my favorite spaces with you. These are spaces that “nourish” me and allow me to clear my mind. In these places I am not concerned about the past or the future … I am mindful only of the present moment. The Vege Garden – The best place to “notice” what is really going on! admin | Space | Comments Off on What SPACE are you in right now?